Today the Southerly came through, and typically cleared the skys over the pass. I took to opportunity to get out and hike up to Temple Car park. When I got there I checked conditions and they seemed pretty solid. The pack has consolidated a little more and there were mostly class one sluffs on NW Aspects. 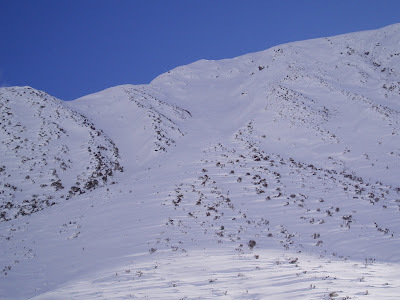 Then I spotted a wide open chute at the end of the Goldney Ridge that was just asking to be skied. So why not! 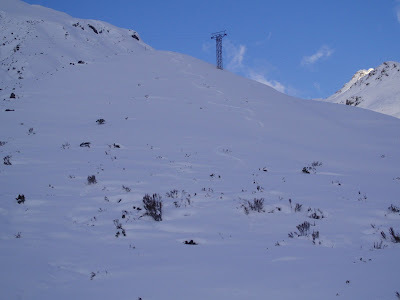 Above are some photos of that, plus after that I skinned to above the first goods lift tower and skied that. That side of the valley was a lot softer. 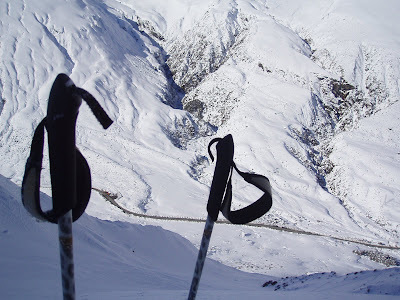 It was great to really be putting the SR8s through their paces in consistent powder conditions. After a few turns I really got the hang of them. Shovelling snow for seven days has to have some rewards!!!! !